The new technological era is imposing new rules and challenges in e-society, dramatically changing the structure and organization of e-communication. These challenges are not meant to be an obstacle but a way for introducing new and better environment for the involvement of citizens and their participation in diverse areas of public interest, including government. With the rise of Web 2.0 set of technologies, governments gained an opportunity to provide better services to their users. Web 2.0 has implied many changes not only in the ways of communication between governments and users, but also in governmental concepts. It can be said that Web 2.0 technological impact initiated changes in the core e-government features and resulted in defining a new focus area and a new concept known as the Open Government. Transparency, accountability, collaboration, and user participation are the main characteristics of this newly introduced concept. 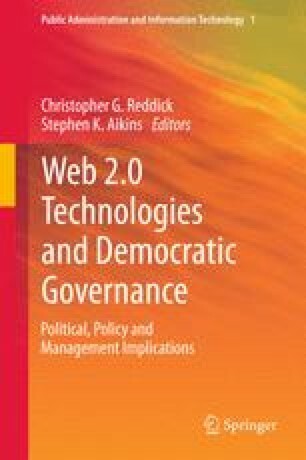 This chapter primarily deals with technological impact, Web 2.0 particularly, on e-government development. It gives a historical overview of e-government models with special attention to the Open Government model. By explaining its main characteristics, throughout the worldwide examples, the authors hope to bring more light on the Open Government initiative and explain its national and international dimension. Mergel, I., Schweik, C., & Fountain, J (2009) The Transformational Effect of Web 2.0 Technologies on Government, Social Science Research Network, Retrieved from http://ssrn.com/abstract=1412796. Obama, B (2009) Memorandum for the Heads of executive Departments and Agencies: Transparency and Open Government, White House, Retrieved from http://www.whitehouse.gov/the_press_office/Transparency_and_Open_Government. Pascu, C. (2008). An Empirical Analysis of the Creation, Use and Adoption of Social Computing Applications. JRC Scientific and Technical Report. Retrieved from http://ftp.jrc.es/EURdoc/JRC46431.pdf. Seifert, J. (2003). A primer on e-government: Sectors, stages, opportunities, and challenges of online governance. Washington, DC. : Congressional search Service, Retrieved from http://www.fas.org/sgp/crs/RL31057.pdf.